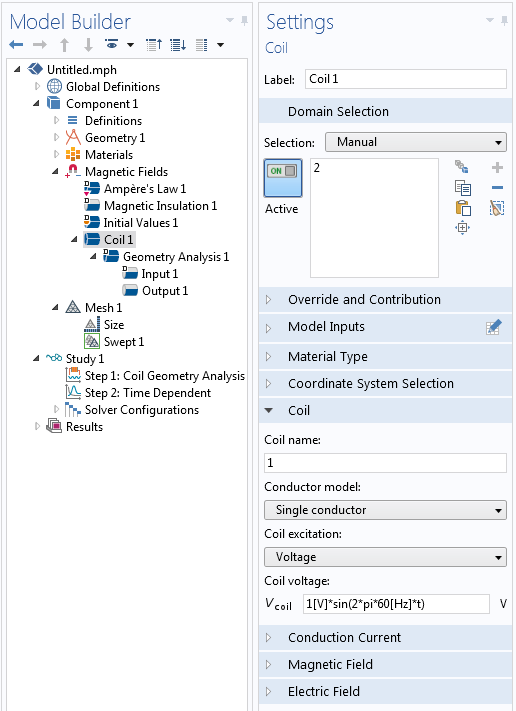 For users of the AC/DC Module, COMSOL Multiphysics® version 5.2a brings a Jiles-Atherton material model for realistic modeling of devices like transformer cores and electrical motors, an updated Magnetic Shielding boundary condition to support nonlinear materials with magnetic saturation effects, and improved Coil features, to name a few updates. Review all of the AC/DC Module updates in more detail below. 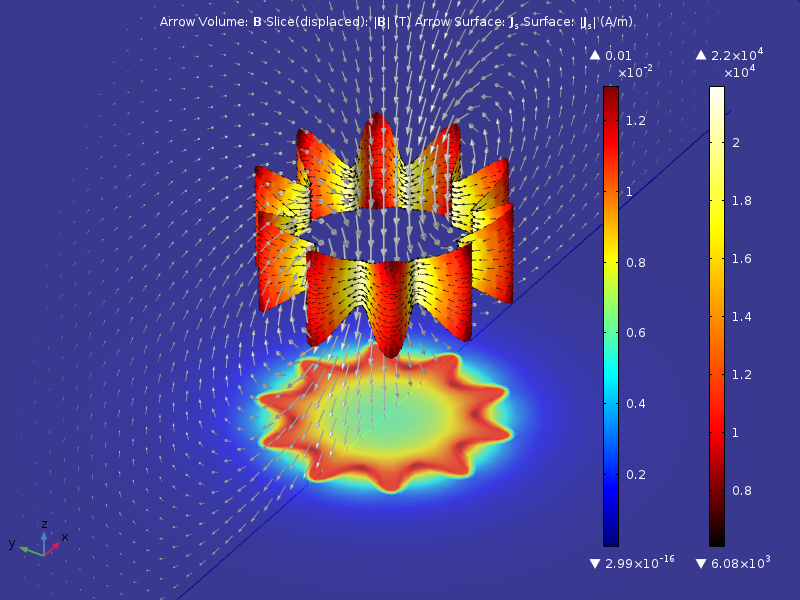 The Jiles-Atherton material model for hysteresis captures important properties of ferromagnetic materials for realistic modeling of devices like transformer cores and electrical motors. This feature is available in the Magnetic Fields physics interface (magnetic vector potential), the Magnetic Fields, No Currents interface (scalar magnetic potential), and the Rotating Machinery, Magnetic interface. It also supports fully anisotropic (vector) hysteresis modeling. The Magnetic Shielding boundary condition has been enhanced by adding support for magnetic saturation modeling using a nonlinear BH curve. It is available in the Magnetic Fields physics interface (magnetic vector potential), the Magnetic Fields, No Currents interface (scalar magnetic potential), and the Magnetic and Electric Fields interface (magnetic vector potential and scalar electric potential). The effect is important when designing thin, high-permeability shields for sensitive electronics, such as photomultiplier tubes, for example. Such shields easily saturate and above the saturation limit, the shielding efficiency drops substantially. The image shows a spherical nickel steel supermalloy shield of 0.5 m radius and 0.5 mm thickness that is subjected to a uniform vertical magnetic flux density of 0.95 mT. The slice and arrow plots show the magnetic flux density distribution. The surface plot on the right half of the sphere (removed and displaced for visualization purposes) shows the magnetic flux density inside the nickel steel supermalloy layer. The surface plot on the left half of the sphere (removed and displaced for visualization purposes) shows the differential relative permeability in the layer indicating the saturation level, going from 100% saturated (unity) near the horizontal midplane to unsaturated (high values) at the top and bottom. 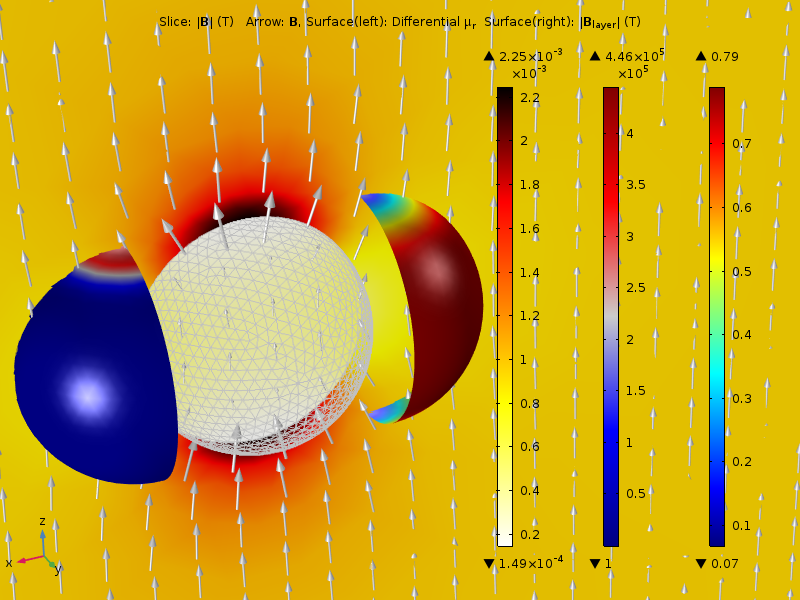 The Magnetic Shielding boundary condition models the shielding capabilities of a nickel steel supermalloy sphere. The Coil Geometry Analysis preprocessing step can now handle Single-Conductor (previously "Single-Turn") 3D coils, which enables the modeling of arbitrarily shaped conductors as sources of excitation for the magnetic interfaces, with better convergence properties than the single-turn coils. The Coil Geometry Analysis feature now supports boundary coils in addition to domain coils. Single-conductor coils with voltage excitation can now be solved in time-dependent studies (in the Magnetic Fields physics interface). Single-conductor coils now apply their excitation as an external electric field, giving physically meaningful electric fields in the entire geometry. A corrugated, thin DC multi-turn coil with nonuniform cross section is modeled using the new Coil feature applied to a boundary. The plot shows surface current density and direction on the coil boundary, as well as the magnetic flux density in both the horizontal midplane (2D displaced section) and as arrows in the vertical midplane. You can now use the Terminal feature in the Electric Currents and Electrostatics physics interfaces on the domain level. This is convenient for geometrically complex electrodes that would involve the selection of a large number of boundaries when using a terminal at the boundary level. The unknowns for the electric potential inside the terminal's domain selection are not solved for, but rather replaced by a variable. This is useful when modeling electrodes with a finite thickness that is respected by the geometry. The Capacitor Tunable model in the AC/DC Application Library has been updated to use the new domain terminal, reducing the selection from more than 50 boundaries to a single domain. 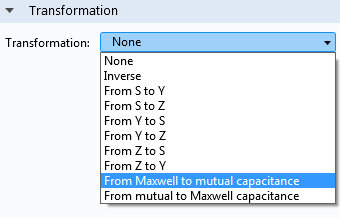 Two new options in the Transformation list in the Global Matrix Evaluation feature make it possible to convert from a Maxwell capacitance matrix to a mutual capacitance matrix (also known as a SPICE capacitance matrix) and vice versa. 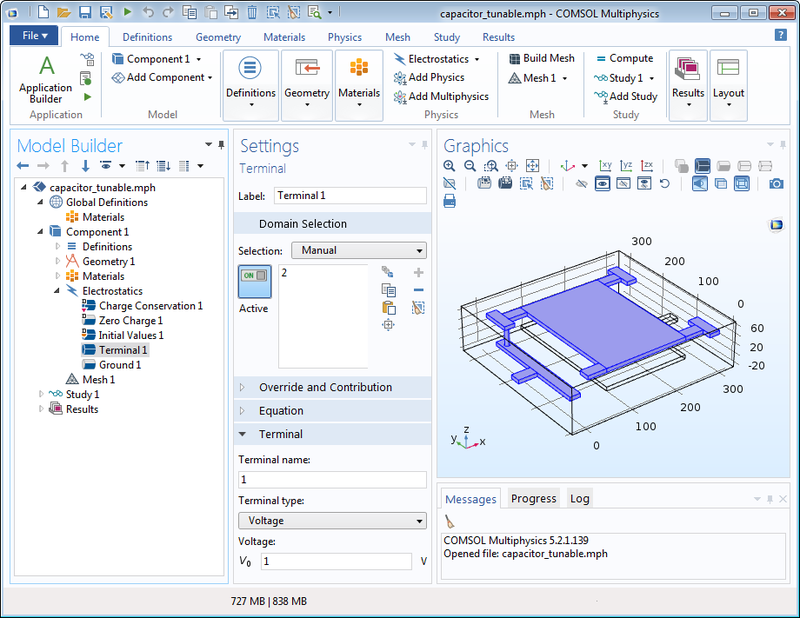 The Maxwell capacitance matrix is typically obtained as the direct output from an electrostatic field simulation, whereas the mutual, or SPICE, capacitance matrix is better suited for use in a circuit simulation. This functionality is available after performing a terminal sweep for electrostatics simulations. The new options are added to the list of previously available transformations including conversions between admittance(Y), impedance(Z), and S parameter(S) matrices. The new options for converting between the two common formats used for capacitance matrices. 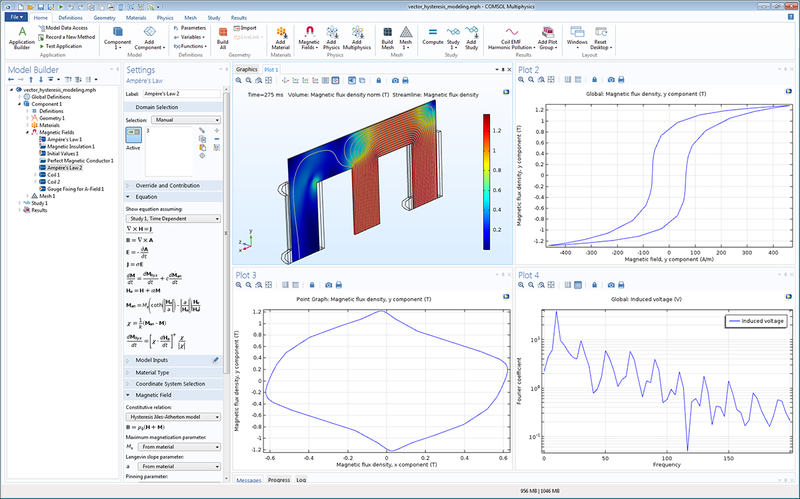 This benchmarking model reproduces the Testing Electromagnetic Analysis Method (TEAM) Problem 32, which evaluates numerical methods for the simulation of anisotropic magnetic hysteresis. A hysteretic three-limbed laminated iron core is subject to a time-varying magnetic field generated by two coils. The Jiles-Atherton material model (now available in the Magnetic Fields interface) is used to simulate the response of the material, reproducing published experimental and numerical data. The coils are excited by AC voltage sources that are phase shifted by 90 degrees with respect to each other, creating a magnetic field that rotates in some regions of the core. The applied magnetic field is mainly oriented in the xy-plane, while the material is anisotropic and so reacts differently to fields applied along the x- or the y-direction. A vector hysteresis model is necessary to accurately simulate the time-dependent field, and the hysteretic behavior is displayed by plotting the magnetic flux density as a function of the magnetic field during one AC cycle (corresponding to one hysteresis loop). A direct solver (PARDISO) is used instead of the default iterative solver where the Gauge Fixing for A-Field feature is applied. Vector hysteresis model showing (clockwise from top left) plots of magnetic flux density plot, hysteresis curve, harmonic pollution of the induced voltage, and magnetic flux By vs. Bx.